Unity brought forth, in a stirring ceremony for A Call To Peace in Pakistan, featuring dynamic speakers who participated in the Teleconference on Saturday, November 22nd. Barbara Wolf spoke about her recent trip to Pakistan and how the planting of a single Peace Pole sparked the interest and enthusiasm from a core group of community members! These citizens represent more than 70 organizations from the city of Faisalabad, Pakistan. ‘Hope for a brighter future ‘ is the lasting impression from when that first Peace Pole was planted, resulting in a crop of 66 Peace Poles that have since emerged from the city of Faisalabad and its surrounding areas. A heartfelt thank you to Barbara Wolf, Founder of the Global Meditations Network in the USA and to Margaret Fikioris! Upon their recent return from Faisalabad, both Barbara and Margaret were anxious to share their experiences regarding the remarkable peace building efforts from the community of “Peace Worker” they visited in Pakistan. Their stories were so inspiring that The World Peace Prayer Society decided to organize this special Teleconference. The “Peace Workers” (see list below) from Pakistan were invited to share their stories with callers from around the world. The “Peace Workers” were especially excited to explain the activities that “engaged communities” in planting Peace Poles and spreading the Message and Prayer May Peace Prevail On Earth throughout the city of Faisalabad and other regions in Pakistan. The people engaged in the Teleconference were moved by the compelling experiences shared by the special guest speakers who elaborated on the “peace building strategies” currently in place in Pakistan. “The efforts for peace building in Pakistan continues,” was the heart of the message, eloquently expressed from each of the guest speakers. Their goal is to uplift peace consciousness throughout Pakistan, with the support of the many “like minded” individuals from the communities in Pakistan. 1) More than 70 organizations have endorsed the Peace Pole Project and plans are underway to expand the planting of Peace Poles in and around Faisalabad. 2) Pakistan‘s High School students have written to the government asking that the words May Peace be in Pakistan be on all legal stationary/documents. 3) Letters have been written to railroad conductors/engineers, requesting that train tickets be stamped with the words, May Peace be in Pakistan. 4) A request to the Pakistan’s Media Network, requesting that all catastrophic “news” broadcastings end with the prayer, May Peace be in (the name of the afflicted country). 5) Peace Poles are urgently planted in the afflicted areas in Pakistan. 6) Peace stickers are being placed on utility poles and bicycles. Following the monologue from the “Peace Workers”, prayers were offered in gratitude to the Children, Women and Men of Pakistan. Prayers were also extended to the bordering countries. The Teleconference concluded with prayers for peace for all of creation! We praise and honor these brave, courageous souls in Pakistan, as they fulfill their mission in the spirit of May Peace Prevail On Earth! In the midst of turmoil and cataclysm, they are still able to ignite the “hope for peace”within the hearts and souls of the people of Pakistan. 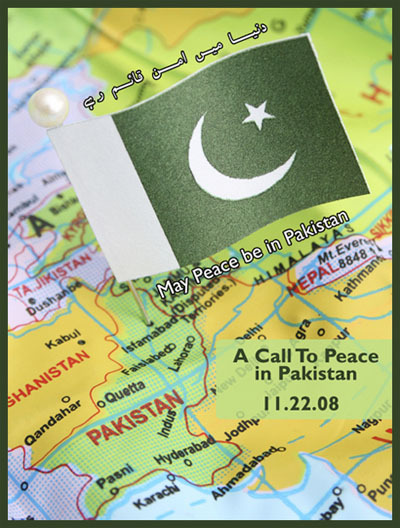 May Peace be in Pakistan! May Peace Prevail On Earth!